When I demo Life Design Analysis to prospects, I like to give a little context on how and why we started the company as I think a lot of advisors relate to the struggle their clients face to understand life insurance options, particularly because their advisor is independent representing different companies all with different marketing material. The core reason our software was created was to communicate insurance options to consumers more transparently. Let me tell you how that happened. It all started when my stepfather asked me, "What can technology do for my business?" My late stepfather, Larry Kinlin, was always a forward-thinking person and, likely as a result of constantly trying to get an edge, was also a top producer in the industry. He knew my passion for technology needed a better outlet than my current position and brought me into his office to see how tech could help him increase the value he offered to his clients. I suppose you could make a case that LDA was in the works when my daughter, Lyla-Grace, was born. This probably triggered Larry to think I should use my skills to a better effect and was likely the real reason he brought me into his office. At the time, I was working for TD bank and while I was quite comfortable at the time, having your first child unexpectedly can certainly get you out of your comfort zone quickly. To understand how tech can help a business you have to first understand the business yourself. So when Larry brought me into his office, I simply said in order to offer advice on how technology can help your business I have to first understand it. With my first child on the way I said, "Maybe it's a good time for you to sell me some life insurance." Larry, an independent advisor, started the same way many do by showing me all the market options using a software called LifeGuide. He wanted to find me the best price out of all the companies he represented. Ask us about our exclusive LifeGuide discount and integration! 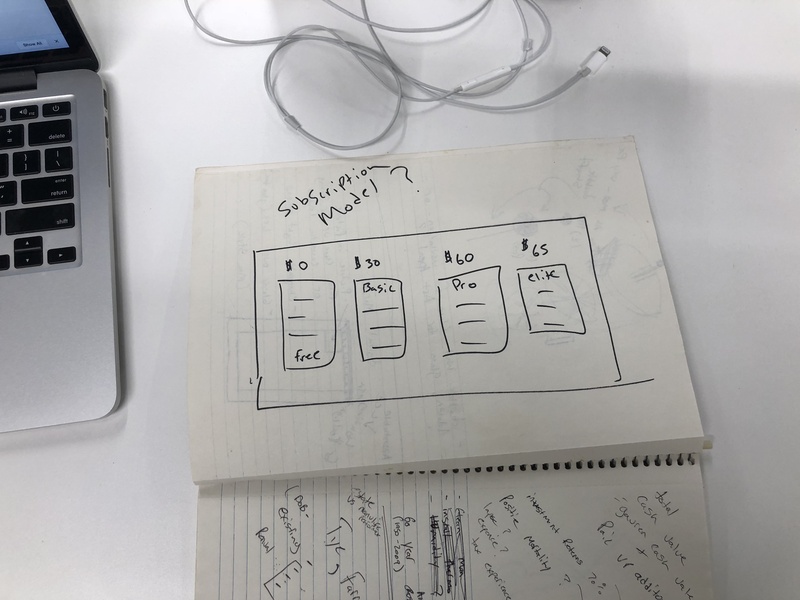 Once he found the best option for each type of insurance, he wanted to show me the details so he would go to each illustration software, create the quote and print out the PDF so he could compare the ledgers side by side. However, even with just three products selected as suitable options, I was handed a stack of papers (roughly 35 pages) and no way to easily contrast the costs and values. For this part of the process, he would have Rachelle, his assistant, do some math and make a word doc summarizing the price differences at key ages. As you can imagine this took a long time to complete. If this sounds familiar please Sign up free today! and change your practice forever. Now, my schooling was in Engineering (specifically mechanical mobile) but simply having the numbers was not enough for me to know what product was the best for the time I would need Life Insurance. I had to validate it, as most consumers want to do this today and are conditioned to research the products they buy. For me, this meant running calculations that would simulate how these products performed over time and even factoring in present value and alternative options. As Larry would say, "I had to go play in my own traffic". As if I didn't have enough information, he also wanted me to know about Whole Life and Overfunded Universal Life so I was handed even more paper to go "play" with. It's true the amount of paper was immense but I noticed an icon on the carrier software that allowed an export of this data, a literal goldmine of information about the products, I asked him to provide this to me as well. Data is key in automation and the more standard and executable, the better. When I met Larry the following Sunday for family dinner (my mother would host weekly), he asked me, "So what do you think?" My response, "I'm not sure why you don't sell the whole life plan to everyone." He simply gave a rye smile. I had one other trick up my sleeve. Instead of taking the numbers and putting them in a document, I had charted the differences out over time with my calculations. I showed Larry what all that data could do and I expressed that I could automate this for him and take his case prep down from hours to literally seconds. He was interested in the efficiency but I could tell as he looked at the visual I created I had his interest. He himself could more easily see the value and wanted me to run this for more of his clients so he could show them. I wanted to find out more about this industry that tech seemed to be absent from. More cases led to more curiosity. The more time I spent in the office, the more I would learn about the product and the industry. I soaked it up like a sponge. I had to know all the loopholes. All the product functions. All the actuarial math. This was all a strategic advantage to sell more insurance by providing multiple acceptable options to the client. As I churned away with the casework, Larry would want to see visualized I started to automate the process little by little, carrier by carrier. Success came fast. Clients resonated with having an easy-to-understand snapshot that communicated the value and gave them transparency. This lead to comfort because they could see why they would pick a product seemingly more expensive initially to realize a gain long term. This validated we were on to something but the reports were still rudimentary, at least by our standards at LDA today. Weeks into this experiment, Larry brought me into his office and said, "I'm going to break a cardinal rule." "Never hire family. You see, if you never hire family, you never have to fire family." Larry wanted me to come work for him and help him show all his clients their insurance options and review all of the in-force policies. I happily accepted on the terms that I got a consulting fee in proportion to the size of the sale, just like how he got paid. I kept learning as I saw new products and situations. Larry was a wealth of knowledge having been in the industry for 50+ years. However, my desire for more data had reached new levels when he asked me to review an "In-force Policy." I learned about a term conversion exchange and felt there was a significant opportunity to automate that education to the over 800 term policyholders in Larry's books of business, but my spreadsheets were going to have to get a lot faster so I started programming macro's in VBA to help me crunch numbers, sort spreadsheets, make graphs, transfer to PowerPoint and then print to Dropbox, it didn't come overnight but that was the goal for our office. We would expand that goal shortly. In the short term, it was all about how to find a way to get each carrier to send me the in force data in the form of a spreadsheet. I fought for years on how to get renewal data before accepting that it is not available and instead creating solutions for the future with better ways to save and store renewal and policy data. After a few years of success using the program with Larry's practice, we successfully doubled his revenue the first year ($700k FYC to $1.4 million and repeating the feat the next year bringing in over $3.2 million in FYC). It was clear the concept worked but it was too powerful for just one advisor to benefit from. This was an industry-changing solution. We had everyone from other agents to wholesalers and Head Office asking what we were doing and when they found out asking for copies of the macro. I always joke it was my golf handicap dropping that made Larry realize I needed more on my plate because of how many cases I could produce in a day. LDA deserved a bigger audience and I needed a bigger challenge. I knew the macro could not scale and but that we had very viable commercial opportunity as every insurance advisor had the same issue. You see 88% of people report they are confused by their life insurance options and cite that as the reason they take no action. I pitched the idea to build LDA into an enterprise solution that could scale globally. I came up with the idea we could create a software as a service that had 3 paid levels and one free version. We got the opportunity to present our idea to a group of IDC advisors at the spring university day thanks to a friend and colleague of Larrys, Ron Madzia (president of IDC Worldsource Insurance Network). I stood in front of 200+ advisors and got to show my creation. Public speaking in front of this kind of audience was not exactly my strength at the time. I simply had no experience and now while I feel comfortable talking to crowds of 500+ it certainly made my stomach twist into a knot standing there the first time hoping the demo would go smoothly. We presented the macro and the concept as it was and asked how many would be interested. All hands in the room went up the energy was exceptional. 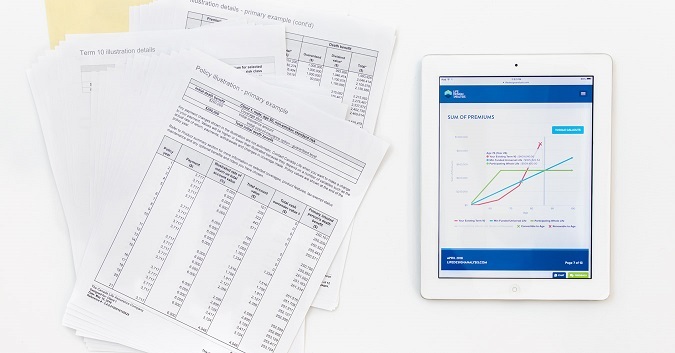 We had one more surprise we were going to turn this limited Excel macro into a web-based platform that they could access from any device and create reports with interactive features they could have never imagined (like case sharing with heatmapping!) We revealed a prototype of the product and talked about the direction we would take it. This validated the opportunity and we went to work designing the beta. They did come, but the free version and self onboard maybe have been looking through rose-coloured glasses. Everyone signed up for the free version and never got to see the value of the full product even though there was a free trial. Now, our free trial is our best package and there is no credit card on sign up so there is no risk we will charge you after the trial if you don't love our product. My days went from running a few cases and coding in my spare time to full-time sales/support/marketing (all while still doing the casework for Larry). At first, the product was very basic and supported the most popular carriers, which was fine for Larry. However, I quickly discovered how diverse the market truly was. Larry focused on the HNW and corporate market but the family market had just as much if not more need for our product as these clients can be underserved and often ignored by agents as they represent a lower potential dollar value combine that with the fact that to be successful in the family market you need volume and if you want to do volume you need a system like LDA. On our site, this meant adding new companies and spreadsheets and product permutations to accommodate this side of the business. It also presented challenges like making sure the site was fully bilingual. One day I get a call out of the blue from Ami Mashlish. Many may not know this legend of the industry by name, but Ami is the owner of CompuOffice software, producers of LifeGuide. He had seen a post on FAO about an advisor having issues with a spreadsheet upload to LDA. Being that Ami is extremely up to date with the insurance world, he was surprised to come across this LDA software. He looked up the domain registrant (me) and gave me a call knowing Larry as a long-time LifeGuide subscriber. Ami suggested a follow-up call, but I offered to meet in person. Ami and LifeGuide have been a big part of the success of LDA as previous to the integration, all the rates and values had to be entered manually. This was a significant opportunity for us to collaborate and bring a partnership between the best multiple quotation services in the business and the best presentation tool in the market. We saw it and still do see it as a win-win for all (consumer, advisor and carrier). 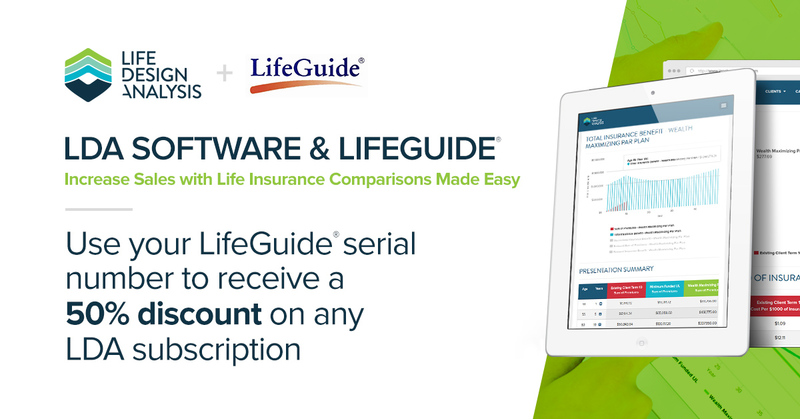 With the integration of LifeGuide and LDA, we knew we were going to have an influx of subscribers who were sick of fumbling with Excel and wanted to enhance their ability to communicate the vast landscape of insurance solutions to their clients. I was doing back-to-back demo's until my voice was hoarse. In short, I knew I could not continue at this pace on my own. A good friend of Larry's forwarded his granddaughter's resume, initially with the intention of forwarding to other companies that might be a good fit. Melissa Tate possessed all the administration, technical and teaching/training skills to fill a sales, demo and marketing role so we invited her for an interview and subsequently hired her. She proved a significant addition to the team but we quickly learned the challenges of hiring for a position focusing on sales, demo and marketing while still supporting a fast-growing business. The business was growing but it was that much harder managing a software business and a full-service practice. Larry had also been diagnosed with pulmonary fibrosis, a degenerative condition of the lungs, and had no interest in running a software business. We had been approached a number of times about selling the business and thought it might be a good time to transition Larry's role of CEO. We found a seasoned SaaS veteran from the health sciences space who was looking to get back into the startup scene (and who also happened to ham and egg it pretty well on the course, a requirement at LDA). Barry Crowther was a natural fit to our team and brought a wealth of experience on how to grow a SaaS product. Another big part of the success of LDA with Larry was that he had a well-established list of clients and that represented a perfect audience to review insurance options with. I thought of his block of business as a gold mine of an opportunity because almost any client can benefit from a frequent review of their policy as it's almost universally true that insurance is never going to be cheaper in the future. However, if you have a well-established block, thinking of acquiring a block or are just building it, you need a way to service and stay on top of critical policy milestones. 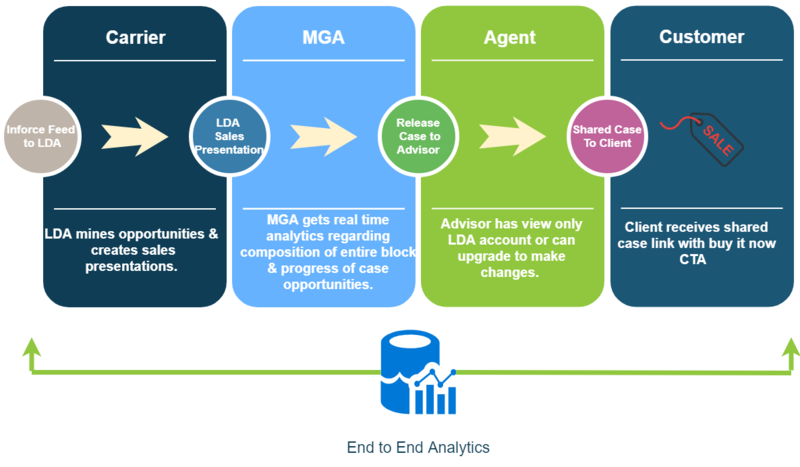 We recognized this issue at LDA and felt that we could add significant value to advisors by automating this once cumbersome task so they would be better equipped to serve their clients and keep their block compliant. LDA had always helped advisors filter their most critical policy opportunities. However, we made huge strides in automating this process with the creation of recipes. Advisors could now receive sales ready presentations when a specific policy opportunity hit its issue date and decide what combination of products they would want to show the client to highlight the value of something that better fits their timeframe. Today, we find our subscribers very much enjoying the marriage of a dynamic presentation combined with the automation around in force policies and we work to bring this technology to bigger audiences. At Life Design Analysis, we continue to push the boundaries on the digital experience with a focus on the consumer. We are working on an embedded version of LDA for your website as well as a cascade model for insurance carriers to service a larger block of business and automate more sales opportunities for advisors. We work towards integration with E-apps to further streamline the consumers' experience with the insurance world and bring it more in line with the expectations of today's customer. We challenge the status quo and we will not accept that legacy systems can hinder a forward-thinking executive at the life companies today! We remain extremely bullish on advisors and their ability to provide more value to their clients!